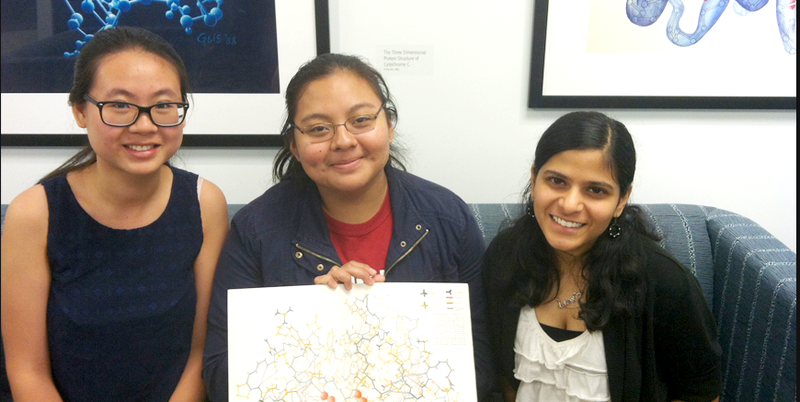 Lysozyme, Models and the PDB: Helping Undergraduates Explore Structure by Krystle J. McLaughlin, Ph.D.
From left to right: Maria Dominguez (Rutgers), Jennifer Jiang (Rutgers), and Krupa Shah (Rutgers). 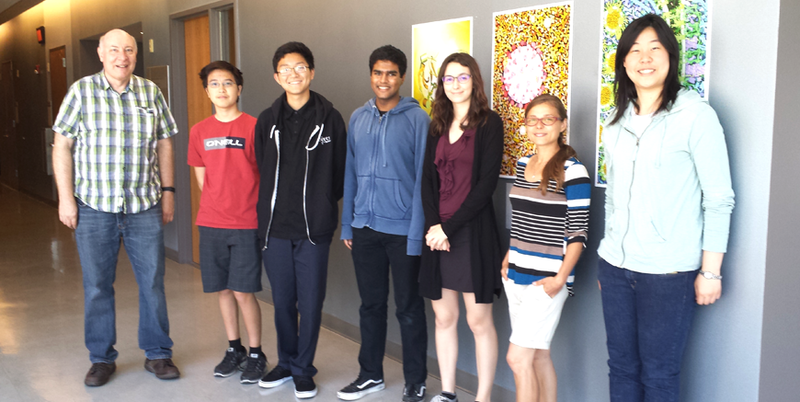 This summer, students will be working on a variety of RCSB PDB-related projects. At Rutgers, Raheel Ahmad (Rutgers), Keyerra Daniels (Winthrop University), and Pamela Amechi (University of Maryland Baltimore County) are using PDB structures to expand the Geis Digital Archive and to perform a survey of small chemical components in the archive. Another team consisting of Rutgers undergraduates Maria Dominguez, Jennifer Jiang, Krupa Shah, and UMDNJ medical student Zaeem Billah are developing educational materials, including resources related to PDB-101’s Health Focus on diabetes. Through SDSC’s Research Experience for High School Students, Michael Wang (La Jolla HS), David Mao, (Westview HS), Varkey Alumootil (Canyon Crest Academy) and Emilia Copic (Canyon Crest Academy) are working this summer with on projects related to fast 3D structural comparisons. In addition, undergraduate Marina Cheng (Smith College) will focus on clustering sequences using Big Data technology. Additionally, RCSB PDB members will be participating in several events at the Intelligent Systems for Molecular Biology (ISMB) and American Crystallographic Association (ACA) meetings in July. We look forward to a very eventful productive summer! Starting June 30, users looking for the wwPDB website can use either wwPDB.org or PDB.org as the URL. RCSB PDB resources will continue to be hosted at RCSB.org. No changes need to be made to bookmarked RCSB PDB resources.